The day is near. President-Elect Obama will be sworn into office on January 20, 2009. Most Presidents state their oath of office using a special Bible, for example their personal family bible. But this President-Elect has decided to use the exact bible that President Abraham Lincoln used when he became President. Barack Obama has identified Lincoln as the one President from the past he admires the most, and is taking great pride and honor in having the ability to use the same bible that is part of the collection at the Library of Congress in his inauguration. Library officers will accompany the bible to the inauguration and will take it back to the Library of Congress that happens to be just accross the street from the inauguration site. It is not believed to be harmful to the aged bible that is being preserved in a special air-tight box stored in a hiddle place at the Library of Congress. Anyone who handles the bible wears gloves, but it is not expected that Barack Obama will be required to wear gloves during his ceremony. Also noted, hopefully the weather will be good, with no snow or rain. If the weather is less than perfect, it is not known if the bible will be used. My guess would be that another bible, maybe the Obama family bible will be present just in case needed for the inauguration. Most likely, the use of the Lincoln bible will be a last minute decision, especially if the weather is less than perfect. 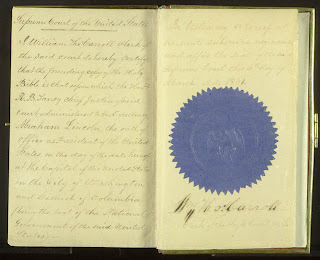 Lincoln, the oath of office as President of the United States….